Viva como o último imperador do Vietnã, Bao Dai, por um dia. Delicie-se um pouco com um cruzeiro de sucos com tudo incluído, com lanches e seis drinques especiais. 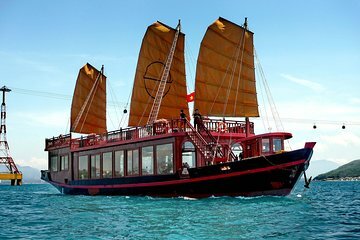 Seu guia lhe dirá tudo sobre a comida e bebida que você está desfrutando, bem como a cultura e história da região, e a paisagem do barco. Visite uma praia secreta que você certamente não encontraria de outra forma e aproveite o snorkeling, o caiaque e muito mais. Very organized tour and well exceeded our expectation. Transportation from hotel to the de-embarcation site was efficient, the boat that we were on was spacious, good amenities and very clean and well kept. Drinks were available all day long when we were on the boat and even on shore. We had a 10-course lunch which was freshly made on the boat and served in restaurant like manner. Diem, the head of the tour group, Phu and Dai the bartender, and the rest of the staff were superb and went out of their way to make the tour enjoyable. We had a wonderful time and highly recommend this tour.